Diva Says What: Donde Estamos? On my trip to MD last weekend my mom's GPS started to act erratically. As in, it told us it would take us 6 hours to go 230 miles. When in actually it took us 8 hours to go over 400 miles. It was way wrong on all fronts. 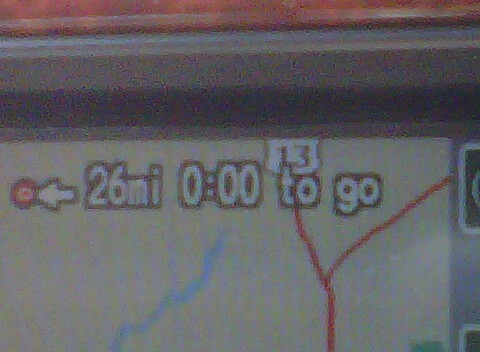 And as the picture above indicates, it also told us it would take us 0:00 minutes to go 26 miles. Now that's just silly. All of the dramz with the GPS made me reflect on my family's extensive and absurd relationship with our GPS's (what is the plural of GPS??). I think the first one of our family clan to get a car with a GPS was my sister. She bought a car from a dealership around DC that was called Radley Acura. This, coupled with what can only be called THE SUMMER OF MARIAH, served as the basis of a fairly lengthy biography that we created for the imaginary person giving us directions. We called him Gary Mariah Radley. His background was dramatic to say the least, including a lifelong fight to prove his masculinity despite his parents insistence that his middle name be Mariah. He remains a bitter man with major mommy issues, and is now for sale with my sister's car. He will be missed for sure! My director is a woman and I named her Laufaunda, a la Napolean Dynamite. By far the least interesting name of the GPS family. My mom currently calls her car captain Lady Largo. I assume this is inspired by her 20+ drives to Key Largo over the life of her car. But Lady Largo wasn't always Lady Largo. For a time my mom called her Rhonda, as in "Help me Rhonda, Help, Help Me Rhonda!" That will always be my favorite. Who knew that Global Positioning Devices could be such an important part of one's family history!? Thank you Lafaunda, Gary Mariah, Rhonda, and Lady Largo for a combined 15+ years of getting us places we might otherwise have had to use a map to get to!